The business newspaper Vedomosti writes that the European Court of Human Rights in Strasbourg has set Ukraine’s claims against Russia in motion. 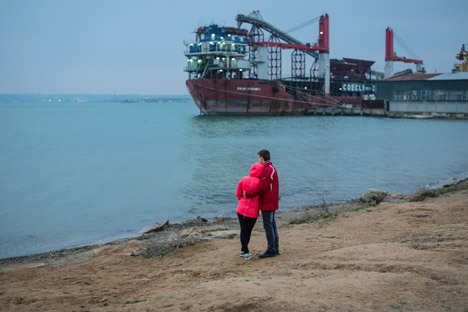 One of the claims, writes the publication, concerns the “departure” of Crimea from Ukraine, its incorporation into Russia, and the subsequent events in eastern Ukraine. Kiev is also accusing Moscow of discriminating against Crimean Tatars based on their ethnicity and of automatically declaring Ukrainian citizens who live in Crimea and Sevastopol to be Russian citizens, while people who have expressed the desire to remain Ukrainian are being pressured into accepting new citizenship. According to Vedomosti, Ukraine has accused Russia of violating 11 articles in the European Convention on Human Rights. Ukraine’s second claim regards the alleged kidnapping of three groups of children in eastern Ukraine and their temporary transfer to Russia last summer. Russia has four months to prepare its answers to the claims, which it will do once it has studied the case materials and taken the thoughts of the competent authorities into account, Vedomosti reports. Gazeta.ru reports that President of the European Council Herman Van Rompuy has called for a decentralization of authority in Ukraine. He is the second influential European official to express that opinion in the last few days, following High Representative of the European Union for Foreign Affairs Federica Mogherini, who shared a similar opinion in an interview with Austrian newspaper Kurier. Van Rompuy is stepping down at the beginning of December and will therefore no longer have an influence on European foreign policy, Gazeta.ru writes. However, statements made one after the other about decentralization in Ukraine indicate that Europe may be adjusting its attitude toward the Ukrainian problem, Gazeta.ru reports. Ukrainian officials have rejected the possibility of scrapping the unitary nature of governance, fearing that it would spell ultimate disintegration for the country, Gazeta.ru writes. For this reason, the statements by Mogherini and Van Rompuy were met with hostility in Kiev. According to Director of Ukraine’s Institute for Global Strategies Vadim Karasev, Kiev received the statements with “smoldering discontent.” In his opinion, Europe is trying to repair relations with Russia by exchanging Ukrainian federalization for a de-escalation of the conflict. At the same time, Karasev stressed that the federalization scenario is unacceptable to Kiev right now because the authorities are being held hostage to society. Editor-in-Chief of the magazine Russia in Global Affairs Fyodor Lukyanov told Gazeta.ru that the statements made by the two European officials do not demonstrate a decline in anti-Russian sentiment, but rather a dramatic drop in pro-Ukrainian sentiment. He connected this with Europe’s frustration that no reforms have been carried out in Ukraine. According to the Kommersant daily, German Chancellor Angela Merkel has again leveled sharp criticism at Russia, saying that “Russia’s actions call the peaceful order in Europe into question and violate international law.” Merkel stressed that in light of the circumstances, economic sanctions against Russia remain inevitable. However, she spoke in favor of continuing talks with Russia. Meanwhile, the decision has been made at the German Federal Chancellery’s insistence to cancel a scheduled meeting of the St. Petersburg Dialogue, a German-Russian civil society forum. Kommersant reports that meetings were held even during the complicated “post-Georgia” period. However, because of disagreements over Ukraine, the German authorities canceled a St. Petersburg Dialogue meeting for the first time in October. They also canceled consultations between the German and Russian leaders, which were traditionally held in conjunction with meetings between civil society leaders.